This week was special because I was down in South Florida doing some collaborative work with the rest of the Ben Moss Group. Every meal we had while in Coconut Grove was amazing. Breakfast at Greenstreet Cafe was so good we actually went there twice. The first day we sat outside and enjoyed beautiful weather while eating steak and eggs. 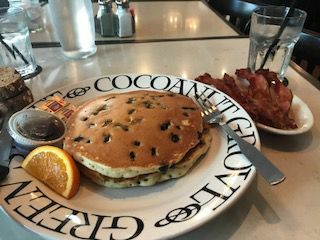 Day two, I switched it up and went for the classic blueberry pancakes. They didn't let me down. Their inside seating area is really cool, it featured a library type setting with couches instead of chairs. It was a relaxing way to get the day started. Greenstreet is conveniently located less than a mile from the Compass office in Coconut Grove which tempted us to walk the office afterwards.... Tempted.